You can subscribe to your or any ‘shared’ calendar posted on Google Calendar. An Internet Calendar Subscription keeps your Outlook copy of your Google Calendar updated. 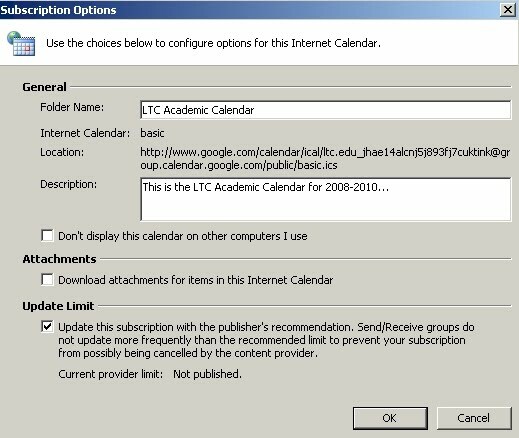 Outlook periodically checks the Google Calendar for updates, and if any are found, they are downloaded to the calendar copy in Outlook 2007. 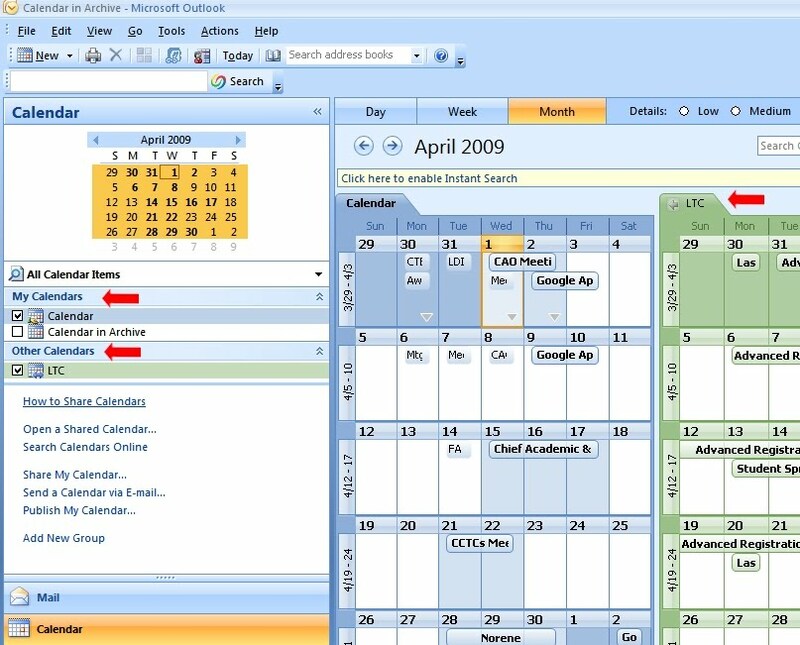 While Google Calendar is a phenomenal web application for managing calendars, many use Outlook 2007. The good thing is you can have the best of both worlds by subscribing to your Google Calendar from Outlook. 1. Log on to your Google Calendar account. 2. In the left column, under My Calendars, click the arrow button next to the calendar that you want to add to Outlook as an Internet Calendar Subscription. 4. On the lower portion of the screen find Private Address and click the green ICAL button. 5. A pop-up window will appear. This will show the Private Address. Highlight (or select) the Internet Web address that appears, and then press CTRL+C to copy the selected text to the Windows (or other Operating System’s) clipboard. NOTE: Do not click the link. If you click the link, the calendar will be opened in Outlook as a Calendar Snapshot which is not updated. 6. 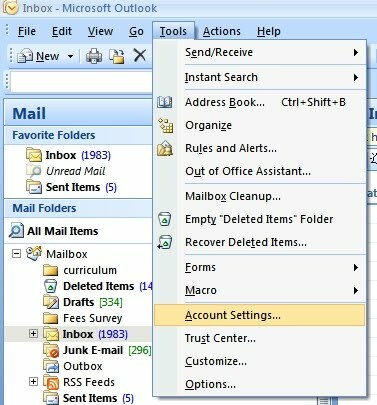 Open Outlook 2007 and go to the menu bar, and select the Tools menu, then, click Account Settings. 7. Click the Internet Calendars tab, click New. 8. 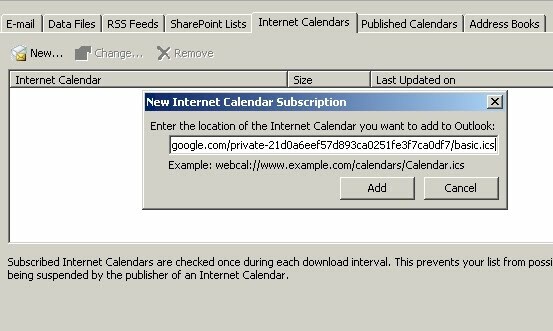 When “new Internet Calendar Subscription” window appears, Paste the Internet Web address you copied in step 5, by pressing CTRL+V. 10. A Subscription Options dialog box will appear. Please name this calendar and describe it as you wish, then click OK.
11. 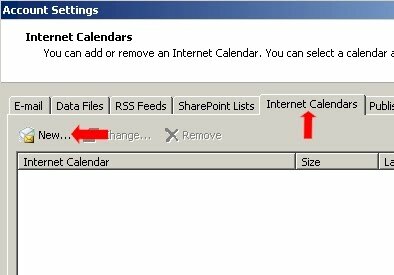 To view your new calendar select the Calendars, Other Calendars tabs on the left side of Microsoft Outlook 2007. 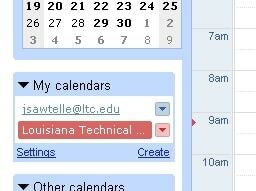 You will then see your LTC Academic Calendar on the right side. NOTE: To make changes to your Google calendar, you must use Google Calendar. Changes made in Outlook are not sent to your Google Calendar.